« Five Nordic Countries Agree to “Drive Down” Oil and Gas Methane Pollution Alongside the U.S.
American cities have made excellent progress in installed solar. For example, the top 20 solar cities, which account for less than a 0.1 percent of total land area, account for six percent of solar capacity. But what’s really exciting is the potential, which is figured to be nearly 1,200 GW, or enough power 790 million homes a year – more than double the current population. If we are able to tap this potential and harness more of our power from this clean, renewable resource, we could avoid substantial amounts of harmful pollution from the electricity sector. One huge barrier to utilizing all this potential is “soft costs.” These are costs associated with processing applications, issuing permits, inspections, and regulatory procedures. Laurence Berkeley National Lab finds soft costs related to permitting can increase typical rooftop installation prices by $700 and, combined with other soft cost factors, can increase a system price by as much as $2,500. These additional fees account for 50 to 70 percent of total rooftop solar costs in the U.S. today. By expediting these processes, cities and third parties can reduce soft costs of solar installation, helping to spread this clean energy resource to more households and communities. 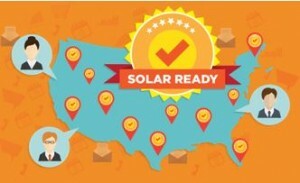 SolSmart, funded by the U.S. Department of Energy SunShot Initiative, is a new program that nationally recognizes communities for innovation and entrepreneurship in the growth of local solar markets. The designation shines a light on communities that cut red tape, drive greater deployment, and emphasize the need for affordable, accessible solar energy across all neighborhoods of a city. The SolSmart program emphasizes the overlooked areas of planning, zoning, and permitting ─ the most malleable tools cities have for sparking economic activity, fair competition, and thoughtful land use. The program offers no-cost technical assistance from a team of experienced national solar experts to help communities qualify. This team can include a fully-funded “Advisor” to assist communities in evaluating local- and industry-leading practices and processes aimed at solar market development. Environmental Defense Fund participated in a multi-stakeholder committee that drew upon expertise from installers, city governments, advocates, and policy shops to develop the robust set of criteria communities need to gain one of three tiers of designation: Bronze, Silver, or Gold. While the foundation of the criteria is built on reducing soft costs, communities also have the opportunity to be recognized for comprehensive and inclusive community engagement. This can include customer bill-of-rights and protections policies, as well as designing programs and financing options like PACE and on-bill repayment, which support rooftop solar options for low- and moderate-income residents. Both PACE and on-bill repayment allow customers to take advantage of energy-saving upgrades with no money down. With PACE, customers use a portion of their savings to pay off the investment over time on their property tax bill, while on-bill repayment allows them to pay it off through their energy bill. Leveling the playing field is critical to carrying out climate commitments by ensuring solar can thrive across all parts of a community. The recent signing of the Paris Climate agreement reaffirms the starring role cities can play in advancing clean energy innovation. The transformative commitments of groups like the Compact of Mayors and C40 were instrumental in building the pressure and momentum needed to get international climate action. Now it is up to countries, states, and cities to implement these commitments, and SolSmart is one program that can help. Leveling the playing field is critical to carrying out climate commitments by ensuring solar can thrive across all parts of a community. Every community and every community member need a place in the clean energy economy. By making progress on soft costs SolSmart and programs like it are making sure all communities feel the benefits of transitioning to cleaner, more reliable energy systems. This entry was posted in On-bill repayment, Solar Energy. Bookmark the permalink. Both comments and trackbacks are currently closed. Jayant and Jorge, as expected it didn’t take long before your sol-train went off the tracks. 1,200 gigawatts, eh? The largest PV solar farm in the world, Topaz, squeezes 165MW of average generation – not capacity – on 9 square miles of prime California desert. It would take 7,272 Topaz-sized solar farms, occupying 65,454 square miles of land, to deliver 1,200 GW. That’s a lot of land area. How much? You’d have to cover half of the state of New Mexico with solar panels, at a cost of $14.5 trillion – four and one half times the entire federal budget – not including transmission, not including nighttime, not including cloudy-time. It’s hard to share your excitement at the potential of such an arrangement when there isn’t any. It’s not a bad joke, I’m just worried some might be dopey enough to take you seriously.